Use mass transportation. The fight to insure mass transportation systems were wheelchair accessible was long, arduous and heated. The opposition to putting wheelchair lifts on buses was fierce. Yet almost 30 years later I know young cripples are scarred. You were likely forced to take a short bus. That "special bus" was probably called the "retard bus" by your non crippled peers. I am sure you hated the bus. I am equally sure you were bullied. You are however the direct beneficiary of older cripples like me who forced our way into schools, onto buses, trains, and planes. In 1978 any person could object to my presence on an airplane. I was routinely denied boarding because I was a flight safety risk. Any passenger or airline personnel could object and I would be denied boarding. When lifts were first put on buses in New York City I was despised. People considered putting a wheelchair lift on buses a ridiculous waste of money. The idea the subway in every major city should be made wheelchair accessible was deemed preposterous. To this day, the New York City subway system is largely inaccessible. But the buses work well for we cripples in most cities. I have been thinking a lot about mass transportation in recent weeks. I am an urban dweller. I use the bus system on a daily basis. Centro bus system in an impoverished city like Syracuse leaves much to be desired. The Centro bus website is abysmal. The Centro app has not been updated in years. Confusion abounds as does substandard service. This makes me sad. I am sad not for myself but the poor residents of a gritty city like Syracuse that need to get to work. Each day I am on the bus I pass building that are falling apart. I see many homeless men and women and various street people. I wonder what will they do when the weather turns cold. I am always the only wheelchair user on the bus. I don't like this. I am also struck by the fact the buses I ride are capable of holding 75 people and yet there are exactly two places to tie down a wheelchair. Clearly we cripples do not travel in groups of more than two. Were are loners, the isolated and unusual. The assumption is the presence of people using a wheelchair is a rare and exceptional event. Get on the bus, please. On the bus are my people. Poor people. White people. Black people. Hispanic people. Many refugees. I hear different languages daily some of which I cannot identify. I see students on the bus too. I see a smattering of faculty members. I see health care workers. I see lots of manual laborers. What I do not see are my crippled brethren. Since July I have gotten on many buses. Not once have I observed another wheelchair user on the bus or waiting at a bus stop. I know my fellow cripples exist. Where are you? Where are the wheelchair users accessing mass transportation? I do not see wheelchair users on the train either. I occasionally pass a person using a wheelchair in an airport but that is a rare event. This is a big problem. The lack of representation, the lack of visibility empowers ableists to question the utility of the ramps on buses and trains. Believe me, ableists abound. They don't want us on buses, trains, and planes. I get it the resistance. Bus drivers, train employees and especially airline personnel treat wheelchair users and a host of people with a disability as poorly as humanly possible. 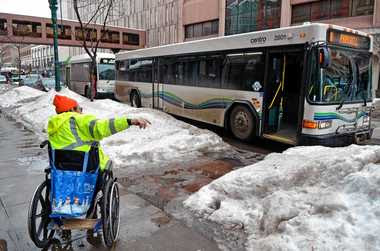 In the last month only one Centro bus driver has truly tied down my wheelchair in a way that I felt safe. The tie downs are applied but it is more show than anything else. If I am on a bus that is in an accident I am going to be seriously injured. I know buses are slow, run late and waiting is not pleasant. And yet I love taking the bus. I love mass transportation. I am with the huddled masses of humanity. I have not been cleved off from the heard. I am part of the society. Society can be an unpleasant place. The bus can be downright unpleasant. Last week the air conditioning on the bus I used was broken. It was well into the 90s. It was a hot stinky ride. I was happy. I was not cut off from others. Please go out of your way and read To Ride the Buses edited by Mary Johnson and Barrett Shaw. Read the Ragged Edge edited by Barrett Shaw. It is a collection of the first 15 years of the Ragged Edge--in my estimation the most important rabble rousing collection of disability rights writing. Oh, how I miss the Ragged Edge. If you visit Denver go put some flowers on the marker dedicated to the Gang of 19 at Colfax and Broadway. Those men and women paid a heavy price to insure wheelchair users could get on the bus, go to work, shop, and be a visible part of society. Go ahead and upset people. Don't be afraid to be confrontational. Be polite too. Do whatever works for you but be present. Assert your rights. If you don't we will all suffer. If we are not present ableists will do what ableists are good at--undermining disability rights. I know as winter sets in I am going to be in a battle with the city of Syracuse. I need to get to the bus stop. Snow removal is substandard. Curb cuts will likely be inundated with snow and ice. Bus stops will be blocked by cars and snow piles. I will be out there rain or shine. Where will my fellow cripples be? I hope to see you. I am lonely. In Australia in the state im in public transportation is also not good for people who use wheelchairs the buses some are accessible some are not there is only 2 wheelchair places if you're in a large power chair you don't fit and there are no tie downs at all i remember when i was using a manual wheelchair and went on the bus and i slid all over the place there are no lifts the buses that are accessible sort of tilt to the side and then the driver puts out a ramp but like I said a lot of power chairs are too big in my city of adelaide there arent many train or tram lines mostly theres only buses and only some of the trains stops are accessible they have a raised part to the platform and the driver puts out a ramp and you go accross it at least if you have a larger chair you fit on the train however there are no trains in my area. I am lucky in that when i was able to use a manual wheelchair i was independent and able to drive using a wymo to store wheelchair on the roof i then got very sick in the middle of 2012 and have been bedridden since then but for about 3 of 4 years of using a manual wheelchair i was able to drive still which was good. I did encounter many obstacles while in my wheelchair not least were curb cuts where the ramp was no where near accessible parking i think a lot more should be done in this area and i wish our buses had tie downs cos you really do fly around the bus! I just moved to a new house specifically so I can access public transportation. I never thought I'd be excited to ride the bus again, but since I still can't drive independently, the bus is important. And I am grateful for all the advocates who came before me and worked to make it possible for me to ride. If people with visible disabilities were able to get employment then you probably would see them around more often. I can only imagine a post-industrial city like Syracuse is probably worse off than some places on infrastructure. Most of these cities are left with a few non-profits that don't pay taxes. Four of Syracuse's top five employers are non-profits. Like many upstate cities, Syracuse probably has serious tax base issues. I know in many upstate cities people pay a huge amount of tax compared to the suburbs and then have to fix everything that breaks in an older home. Like Syracuse, the major employers are colleges and hospitals that are exempt from property taxes. They may volunteer something to cover police and fire, but the infrastructure costs can fall on everyone else. The other part of the issue is employment. Disabled people can't get proper wheelchairs from medicaid/medicare. They don't have employer provided healthcare. Even if they did have proper equipment the available jobs for wheelchair or power chair users is in short supply. They're the desirable desk jobs that require lots of 'experience', the typical "must be able to lift 40lbs and stand on one leg", or the office just isn't accessible. At a certain point you start to see the logic in just making the route to the Social Security office accessible. There's a systematic failure that starts way before the bus stop. The Independent Living movement in some places has failed. They love the developmental disability, addict, or psychiatric grant dollars, but don't seem to care about much else. Physical disability is so 90s. I guess it's probably easier to handle fixing issues with physically able people, because it has been over 20 years since the ADA and we sure as hell haven't fixed the cripple problems. So they fixed the cripple problem by pretending we don't exist, unless you're a veteran. I'll be lying here in my bed until they wake up. I won't have to worry about the associated trauma...there's a grant for that. Well, if it helps, I'm another stubborn cripple, who does take the regular transit wherever possible here in Toronto, Canada. All of the buses have lifts or ramps, and about half the subway stations have elevators. There are new wheelchair-accessible streetcars (though these have their own set of problems, but I could write another essay on that), though the delivery on those is behind. I think it helps that here in Ontario, there's legislation that says that all conventional public transit must be accessible by 2025. It's a slow process, but it is going forward, and has gotten a lot better even in the past few years. It used to be I was the only wheeled cripple on the regular buses, but now I do sometimes see other wheelchair users. I actually quite often see people with canes and walkers, and I'm glad to see them -- it means that the accessibility stuff is actually getting used. In my city (Perth, Western Australia) there are no tie-downs for wheelchair users on buses. I got badly injured when a bus turned a corner too fast on a wet road and my powerchair flipped over onto its side, crushing my left leg beneath it (and narrowly avoiding breaking another passengers leg). Several years on, and I still have pain (that I didn't have before the accident) and physio bills. No money from the transport company because "the driver wasn't negligent". The lifts to train platforms are constantly breaking down (each and every month) and they take up to 12 weeks to be fixed. There are no ramps, only the broken lifts. Often the buses on "guaranteed wheelchair accessible bus routes" aren't wheelchair accessible. Or if they are wheelchair accessible buses, the electronic wheelchair ramp has broken down and not been fixed. Ramps break at the beginning of a 12 hour shift and the bus doesn't go back to the depot to get fixed, so bad luck for any wheelchair users who need to catch that bus. I've had bus drivers with almost empty buses sail on past me at the bus stop because they couldn't be bothered deploying the wheelchair ramp. I have been verbally abused and physically assaulted by other passengers for the crime of using a wheelchair in public. One man hit me with his walking stick hard enough to tear my jacket sleeve. This was in broad daylight. Another man grabbed my shoulder and breast (right in front of his wife!) and then got angry when I objected, saying he was only trying to get my attention, only trying to help me. This was in broad daylight. Another man told me "you're everything that's wrong with this world", and then tried to punch me in the face - only another passenger grabbing his wrist stopped his fist connecting with my face. This was in broad daylight. I've started carrying pepper spray with me at all times because I've been assaulted and threatened so often on public transport. I dread using public transport, because it's such a stressful and traumatic and frightening experience. When I use wheelchair taxis, it's a respite. I know that they will turn up, and their wheelchair hoist will work, and I will get to my appointment on time, rather than having to see bus after bus with a broken wheelchair ramp go past.